MOSCOW (Sputnik) - The Russian center for Syrian reconciliation has begun the withdrawal of militants from localities near Muhayam al-Yarmuk through a temporary humanitarian corridor, the center's chief, Maj. Gen. Yury Yevtushenko, said at a briefing Thursday. "As part of agreements reached earlier, the reconciliation center and Russian military police units, with the observance of security measures, started the withdrawal of militants and their families from the settlements of Yalda, Babbila and Beit Sahm in the Muhayam al-Yarmouk district," Yevtushenko said. The settlements are located on the southern outskirts of Damascus. The Palestinian refugee camp Yarmouk was established established in 1957, about 18,000 people are estimated to live there. Militants have been holding major portions of Yarmouk. 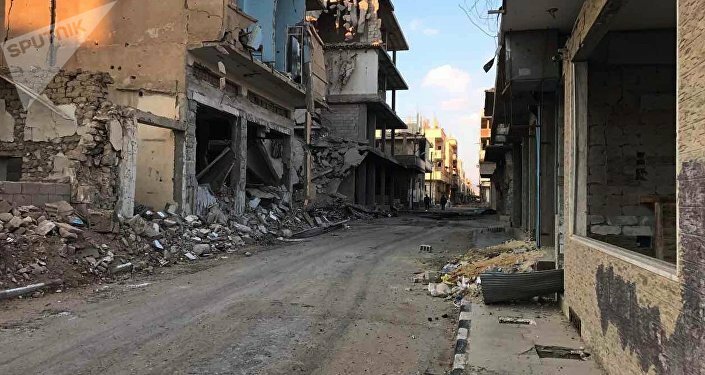 Recently, local media reported that Syrian government military forces advanced to the south of Damascus, namely the city of Al Hajar Al Aswad, severing the militants’ supply chains, and continuing advancing toward the neighbouring Yarmouk refugee camp.